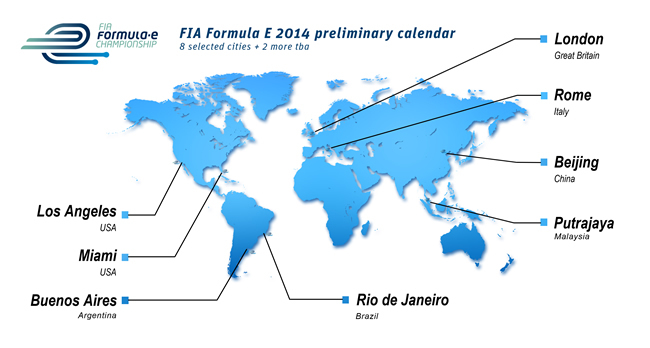 FIA with a preliminary list of 8 cities, all selected to host races next year. The races will feature Formula cars powered exclusively by electric energy. Cities that are included in the preliminary calendar are: London, Rome, Los Angeles, Miami, Beijing, Putrajaya, Buenos Aires and Rio de Janeiro. Since its launch in August 2012, FEH has received formal demonstrations of interest to host a race from 23 cities across 5 continents. FEH intends to organise up to 10 races in 2014,theinaugural year of the Championship. A further 2 slots will be kept free, to include 2 additional cities among those that have expressed interest. The promoter has started work ing with the 8 cities included in the calendar, to discuss all the specific elements involved in hosting a street race. The objective is to finalise formal agreements with the cities on or before July 1st 2013. The final calendar will be presented to FIA for its approval at the September 2013 World Motor Sport Council. de Fédération Internationale de ĺAutomobile." mobility and sustainability. The provisional calendar we publish today is composed of cities in America, Europe and Asia. We look forward to also racingin Africa and Australasia from 2015 onwards." solution for mobility incities of the future." With regards to teams, so far FEH has proposed two teams out of ten to the FIA for the 2014 race, these are: the first British team–the FIA Formula E Team Drayson and the first official Chinese team-FIA Formula E Team China Racing. In February 2013, the Italian company Dallara announced it would design the first Formula E cars and the first sketches have already been released. McLaren is designing and building the powertrain for the cars in a consortium with Spark Racing Technology (SRT), a new company led by French businessman Frederic Vasseur. Formula E is an ‘open’ championship, it encourages cardesigners and constructors to build a Formula E car. The FIA technical regulations have set the framework for making such submissions possible. To ensure the availability of cars for the first year, FEH has ordered 42 cars from SRT for the 2014 Championship.